The earliest Mother’s Day may not be as old as some gemstones, but Ancient Greeks celebrated maternal goddesses around this time in Spring and their tradition continues on May 12th. That’s a week a way, Boys. Time to get Mom something that says she’s a goddess and a mom all rolled into one. Just don’t mention anything about being ancient. What Moms appreciate most is love from their children. At least that’s what Mom tells me when I gift her a mug I made in amateur pottery class. While a Mom’s love lasts forever, there just happens to be a jewel that carries the same eternal reputation. It’s our Royal Eternity Band Diamond Ring available here. Made of always-fashionable 18k white gold, this rare piece offers 1.94 carats of diamond on both sides. See it up close below! Shop till you drop are not the rules to play by when shopping for Mom. Los Angeles traffic alone will drive any good man to surrender to buying Mom roses off the freeway. Rather than mall jump or circle endlessly around Bel Air boutiques, shop online in the comfort of your home at our online store. Visiting for the first time? Our most coveted pieces are here to make shopping easy. 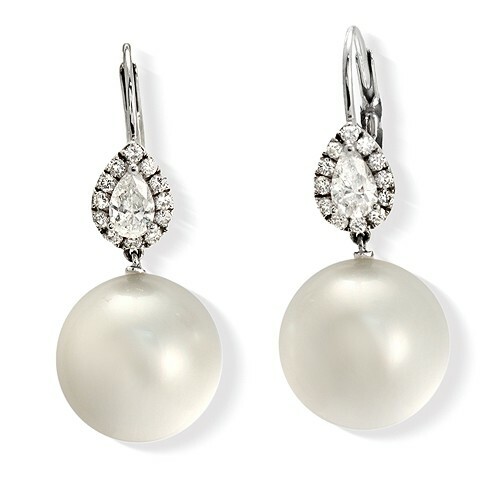 My Mom called from the beach today, which reminded me of two-of-a-kind South Sea Pearl & Diamond Drop Earrings. They may not have their own commercial, but these up-and-coming beauties are sure to lure a mermaid out of water with their luminous diamonds shaped like rain drops and iridescent pearls. May we remind you Mothers Day precedes jewelry’s biggest convention of the year at JCK Las Vegas on May 31 – June 3, 2013. Hosted by Mandalay Bay, registration has already opened. No matter what you get Mom, make sure she enjoys a vacation surrounded by two loves in life: family and jewelry. Who can resist? Get Mom tickets by visiting JCK’s registration page. Bel Air Jewelry presents its finest collection at JCK this year. Shop at our online store to find our biggest sales before the convention. Still on the fence with Mom? Can’t decide between diamonds and pearls? Why not have both? Our showy South Sea Pearl, over 14mm in diameter, make another appearance, this time on a round-cut diamond ring with a 18K white gold band. We’ll see you and Mom this summer at JCK, hopefully rocking jewels from Los Angeles’ one and only Bel Air Jewelry! Thanks for reading and Happy Mother’s Day!